F2 Fun and frustration which a family comedy entertainer has been doing a great pre-release business. The film is already been widely loved by the audience and has great expectations to fulfill. The movie was released worldwide on 12th January 2019. The pre-release business of the movie was around 34.5 crore worldwide. The business in Andhra was around 14 Cr and the overseas business was around 4.25 Cr. The business in Nizam and Ceded area was around 9 CR and 5 Cr approximately. The business in ROI was around 2.25 crores. There is a huge excitement about the movie in both the cast of the movie and also the movie goers. The festival of Sankranti is around the corner and the extended weekend holiday allows for all the people to spend more time with their family. The cast shared their excitement about the movie during the pre-release event. Actor and comedian Srinivas Reddy who is also a part of the movie said that in this season of biopics, he wished F2 which was a biopic of men would be a great hit. The female leads of the movie Tamannah and Mehreen also shared their excitement about the movie and their experience with the cast of the movie during its making. The director of the movie, Racha Ravi had said that there was a time when people used to wait to have fun during Sankranti holidays but now they are waiting to have fun with the movie fun and frustration. The movie had already a huge buzz among the film goers a long while before its release. It all started when actor Varun Tej took to twitter to announce the movie. The fans of all the actors were looking up to the movie. The first looks of the movie, the trailers, the teasers and the songs of the movie were all widely loved by the audience. The movie F2 Fun and Frustration is the first collaboration of Varun Tej and Daggubati Venkatesh. It is being produced by Dil Raju. 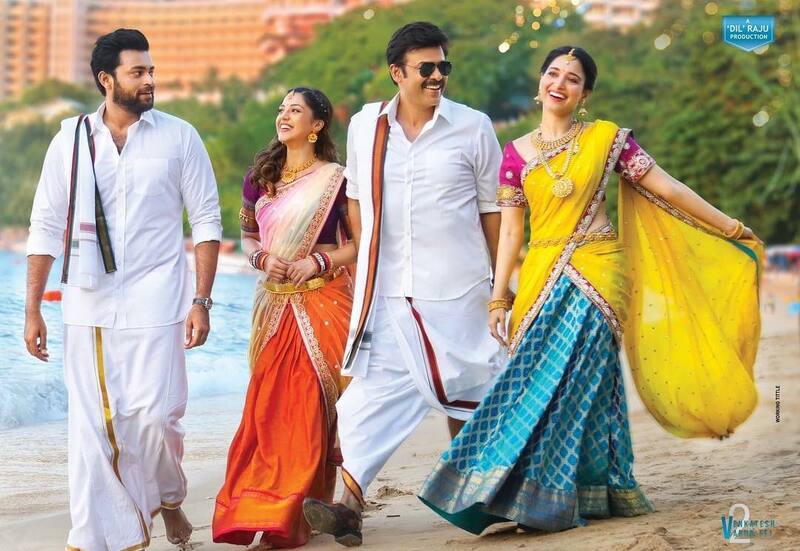 The film stars actors Venkatesh, Varun Tej, Tamannaah Bhatia and Mehreen Pirzada in the lead roles. The direction of the movie is done by Anil Ravipudi. The film is supposedly a family comedy entertainer. The film has elements of both romance and comedy in it. The music of the movie has been done by Devi Sri Prasad. Apart from the lead pairs, The movie F2 also stars other actors such as Rajendra Prasad, Prakash Raj, Jhansi, Vennela Kishore, Priyadarshini Pullikonda,Anasuya Bharadwaj, Brahmaji, Raghu BAbu, Annapoorna, Y.Vijaya, Nassar and several others.